Since 1993, San Francisco International Building Supply has offered architects, builders, contractors, designers, and homeowners an eclectic range of American, European, German, Japanese, Spanish, and Swiss faucets and fixtures. 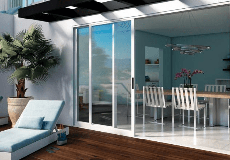 In addition, we offer windows, skylights, entry doors, wardrobe doors, and garage doors. Our high-end three storefront decorative showrooms are definite sites for sore eyes. With our professional sales staff being fluent in English, Cantonese, Mandarin, and Tagalog, rest assured that you would definitely be met with excellent customer service. So come on in and visit us during our business hours of Monday through Saturday 8:30am-6:00pm with free parking located in the rear. San Francisco International is rated 5.0 out of 5 by 2. Rated 5 out of 5 by BenSF from Very Satisfied! This Certified Milgard Dealer has beautiful displays of the various Milgard Windows as well as Doors. I purchased my windows here and a Patio Door. Everything arrived as scheduled. I was very satisfied with doing business with S.F. International Building Supply! Rated 5 out of 5 by Yolanda from SFI is Excellent! Beautiful Milgard windows on display in this large showroom. The salesman was very friendly, funny, patient, and knowledgable. He answered all of my questions. The windows came on time and was delivered to my home.